A new Pew Research Center survey reveals that 70 percent of adults, regardless of political leanings, believe local governments should be able to invest in municipal Internet networks. 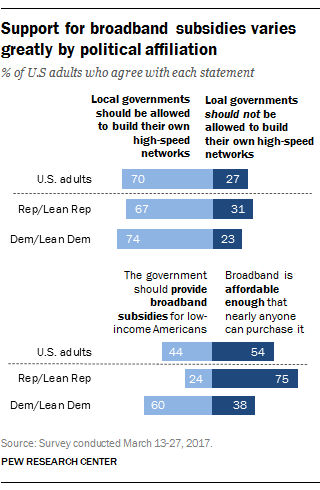 The survey, conducted March 13 - 27 supports the finding that local authority for telecommunications decisions is a bipartisan notion. On closer examination of the survey results, we see that 67 percent of Republicans and Republican leaning respondents and 74 percent of Democrats and Democratic leaning respondents support local authority to invest in municipal networks. In Colorado, two more local communities voted this month to opt out of the state’s restrictive SB 152. The law prevents local communities from investing in Internet infrastructure to offer telecommunications services or work with a partner to improve local connectivity. Colorado Springs and Central City became cities 97 and 98 to join the growing list of communities opting out, which includes places that have taken action to deploy and others who merely want the option. Colorado Springs, known as one of the state’s more conservative communities, passed the measure with 61 percent of the vote, not far from the results of the Pew Research survey. The survey also asked U.S. adults about how important high-quality Internet access is at home. Forty-nine percent said home broadband is essential and 41 percent described it as important but not essential. That leaves just one out of ten survey respondents who describe home broadband as either not too important or not important at all. Respondents also answered questions about assistance to low-income households to help them pay for Internet access. Unlike support for municipal networks, political affiliation, income level, and current access to the Internet appeared to play a part in respondent replies.